Jacob Trouba is really good and the Winnipeg Jets shouldn’t consider trading him, even if the return is a No. 1 defenseman on a team-friendly contract who hails from Manitoba originally and would love nothing more than to come home. Thankfully for Jets fans, all signs point to the club being completely unwilling to part ways with the 22-year-old two-way defender. While the latest reports suggest that Trouba will not be dangled as trade bait in a potential Travis Hamonic deal, an increasingly common theme in the reporting of the most plugged in insiders in the industry is that working out a contract extension with Trouba could prove difficult for the Jets. In the latest edition of TSN Insider Trading, Bob McKenzie summarized the latest scuttlebutt concerning what Islanders general manager Garth Snow is seeking in a potential Hamonic deal. Once he was done discussing how particular Snow is being about a potential Hamonic return, he circled back to the Jets. McKenzie’s allusion to the expensive nature of a potential Trouba extension was then elaborated on at length by TSN’s Darren Dreger. McKenzie and Dreger’s comments caused my ears to perk up for two major reasons. 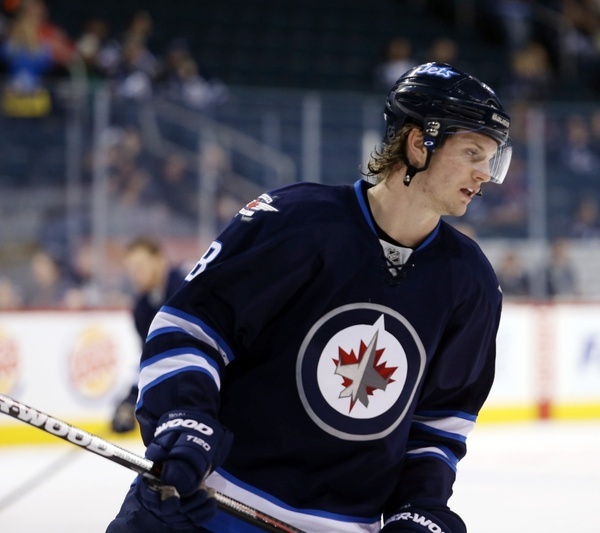 The first is that I wrote about the possibility of a Trouba extension a few weeks ago, and suggested that it would behoove the Jets – an internal budget team – to try and sign Trouba to a Roman Josi-type deal. The second is that Sportsnet’s Elliotte Friedman made some similar comments on Monday, during the radio appearance in which the ace reporter opined about Dustin Byfuglien perhaps being on the trade market and set the blogosphere on fire. Overhardt is an interesting figure and has been of particular annoyance to a variety of budget conscious clubs in the past – just ask Jarmo Kekalainen. Or don’t, come to think of it. The Denver-based player agent has been a thorn in the side of a variety of general managers over the years; from Jim Benning to Don Maloney, the latter of whom admitted to Friedman that, in the wake of the arduous negotiating process that cost the then-Phoenix Coyotes Kyle Turris, considered never dealing with Overhardt clients again in the same fashion in which some MLB teams avoid drafting or signing players represented by Scott Boras. Now I have general dislike for when player agents are cast as the villain – as Overhardt has so often been. Overhardt’s duty is to maximize the earning power of his clients and represent their interests, and he’s very very good at his job (see: the extension Ryan Kesler signed this offseason). And, realistically, it’s probably not in Trouba’s best long-term financial interests to sign the sort of lengthy contract that John Klingberg did in Dallas or Josi did in Nashville. While that sort of lengthy deal would allow Trouba to make more in his two remaining pre-arbitration campaigns, it would neuter the value of his unrestricted free agent seasons significantly. If Trouba really is the top-end defenseman we all think he is, then such a long-term pact would probably cost him money in the aggregate. That would be precisely the point, of course, from a Jets perspective. Now what follows is just a mental exercise on my part and there’s still probably some sort of sensible deal to be made here. If Trouba’s camp is reluctant to sign a long-term pact this offseason though, you’d have to understand why. NHL players like security, but they’re also generally super confident and wiling to bet on themselves. There’s no doubt that, at the moment, Trouba’s value is at a low ebb. From the perspective of Trouba’s camp this probably isn’t the time to cash in long term. There are other potential concerns too. The Jets, after all, signed Zach Bogosian to a backloaded deal and then traded him to the Buffalo Sabres immediately before his salary began to exceed his cap hit. You’re naive in the extreme if you don’t think a maneuver like that one captures the attention of NHL player agents. Trouba won’t be eligible for no-trade protection until the 2020-21 season, and loyalty goes both ways. Why commit long-term to an organization when there’s good reason to doubt that they’re a) willing to spend to the upper limit of the salary to surround you with the best available talent and b) willing to keep you around for the duration of your long-term pact? It seems obvious at this point that the Jets won’t deal Trouba, even if the return is a defender of Hamonic’s caliber. That’s the right decision. The early indications though would suggest that working out a contract extension for Trouba may prove difficult. Considering the complicated negotiations the club will have with core pieces like Andrew Ladd, Dustin Byfuglien and Mark Scheifele over the next seven-to-nine months, that’s the last thing the Jets need.